Generally, User submitted images (profile pictures, social media posts, and business documents) are needed to be moderated to protect business and quality. If a large number of images are submitted in an application then manual moderation is time consuming and is not instantaneous. 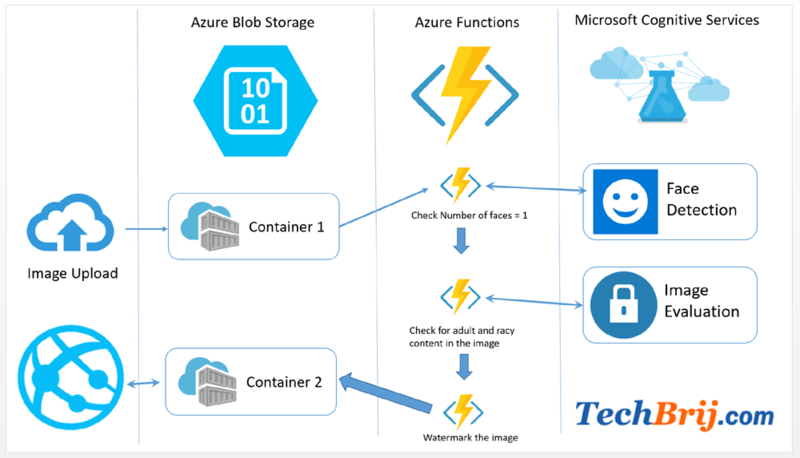 This post explains how to automate image moderation using Azure functions and Cognitive Services. Automated moderation applies machine learning and AI to cost-effectively moderate at scale, without human involvement. Cognitive Services = provides APIs to transform your apps with artificial intelligence (AI). i.e. Container = a grouping of a set of blobs. 1. An image is uploaded in Blob storage container (say Container1) by user or by any application. 2. This is configured to trigger an Azure function when a blob is added. 3. Azure function will call Face Detection API of Image Moderation in Microsoft Cognitive Services and get faces count. To ensure single person in photo, we validates faces count must be one. 4. After that, Image Moderation API’s Evaluate operation will be called to predict whether the image contains potential adult or racy content. 5. If the image is valid then some branding text is added as watermark and new image is saved in another container (say Container2) which is used by the application. You can archive/delete the original image. So that, in case of manual moderation, only images will be present which are either automatic rejected or pending review. It is assumed you have Azure subscribtion. On Azure portal, Click “+ New” and enter “Content Moderator” in search box. Click on “Create” button to create. It is part of Cognitive Services. Now Go to the resource and click Keys. You will get two keys- KEY 1 and KEY 2. We will use it in the Azure function. 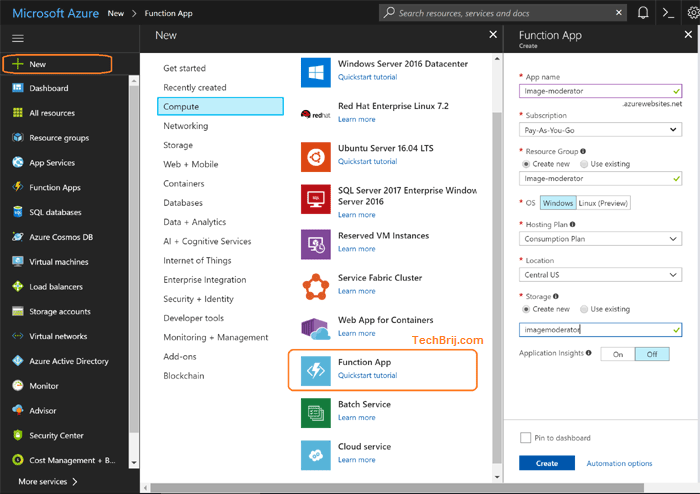 On Azure portal, Click + New > Compute in Azure Marketplace > Function App. Enter Name and other information. For simplicity, we pick Create New option for Storage and enter name. We will use the same Storage for image upload. Click on Create button. Now Go to All Resources, you will get Storage account and Azure function app created. Click on Storage account > Blobs > + Container. Enter name container1 and set Container as public access level and click OK. Similarly, create another Container container2. User submitted images will be saved on container1 and after moderation, the image is watermarked and saved on container2. 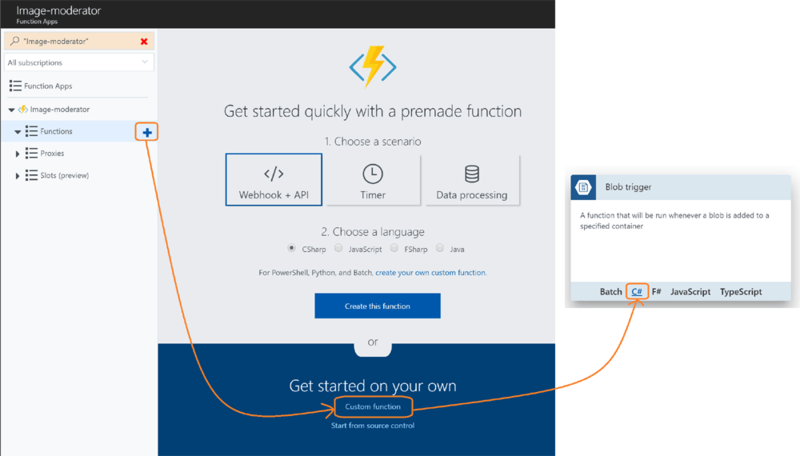 Go to Azure Functions > Select the function app we created. Click on + icon of Function > click Custom Function in bottom > Blob Trigger > C#. Storage account connection: select option which has connectionstring of the storage account. 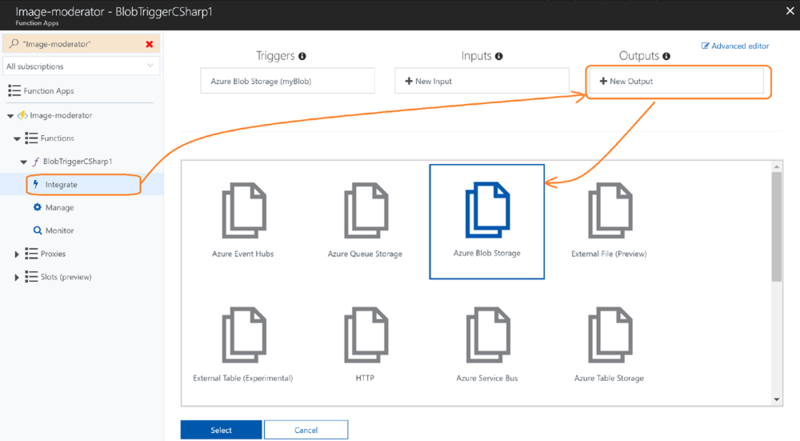 Now, click on Integrate > + New Output in Outputs > Azure Blob Storage > Select. Open Logs window and click on Save. You will get following message. 2018-01-14T03:45:07.061 Script for function 'BlobTriggerCSharp1' changed. Reloading. On Save, the function is compiled. Any errors during the build are displayed in the Logs window. Now when any file is added on container1, this function will be called automatically. In the logs, you will be able to see the output logs. Let’s add following method for http request and get response as string. It will be used to call congnitive service APIs. Here, we are going to validate that there must be one person only in the image. So, we will get face count using Content Moderator’s Image Moderation API. Before get started, first, copy the key of content moderator service which we subscribed. The best way is to use environment variable to use it in function. But for simplicity, we are assigning it to a variable directly. Note: You need to update url according to your content moderator subscription. First, we will validate faces count if it is okay then evaluate image for adult or racy content. The next step is to add watermark on valid image and save to container2. You can update font size as per your choice. Let’s update Run method to call it. Now you can upload a valid image in container1 then you will get watermarked image in container2. – Use Evaluation operation of Image Moderation API to filter out adult and racy images. Enjoy Azure AI for making moderation easy ! !